It goes without saying that we thoroughly approve of a late-80s Sedan DeVille with the full-on pimp treatment. However, when John Law suspends your license, you don't try to drive said car from the courthouse. David B. 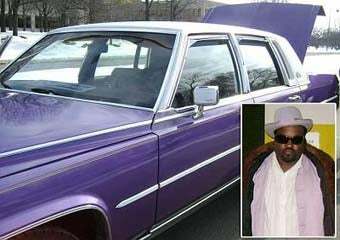 "Mister Oldskool" Johnson rolled up to the Markham, Illinois, Courthouse in his 1988 Cadillac Sedan DeVille, and every detail was in place, from the purple fedora and full-length fur coat to the "PIMP PLAZA" plaque on the dash. Well, every detail save one really important one: his driver's license. You see, the reason for the courthouse visit was the little matter of 13 charges of driving on a suspended license, and the judge issued a 10-day jail sentence beginning next week… with stern orders not to drive until then. So, Cook County Sheriff's Deputy Frank Czerwinski figured he had the proverbial fish-in-a-barrel bust when Mister Oldskool headed out to his ride, dusted it off with a purple feather duster, and drove off. Straight to jail, and we can only hope the tow truck driver was nice to that Cadillac.